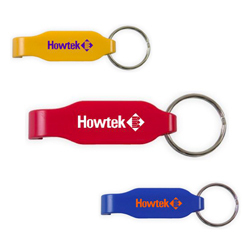 Custom Key Tags present ideal promotional options to display your brand's name and logo. Depending on the nature of your marketing campaign, your selection of key holders is likely to vary from key tag flashlights to your everyday pocket key tags.Garrett Specialties has a promotional key chain for every personality. 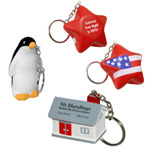 Choose from dozens of unique and attractive promotional key chains, holders and tags. Each can be customized to impress recipients. 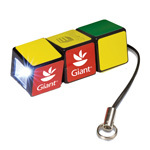 We offer a keychain compass, key lights, translucent tape measure keychains. Make our key chains a key component of your success.rider with advertising key chains and car key tags, and order them in bulk for large giveaways. Allow about 5-7 days for processing and shipping. 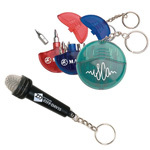 Make an eye- and door-opening statement today with promotional key chains from Garrett Specialties. Say goodbye to that stressful feeling of looking for your keys. Our custom keychains make it easy to keep all of your keys in the same place, and the best part is, they can be customized to your liking! We have light up chains, coil tags, carabiner holders, metal rings, stress balls, and other fun gadgets. Have your own design, name, or logo printed and pick your colors. These cute little accessories make great gifts all types of people. They say that branding is the key to a successful company, so why not brand your keys with your company? 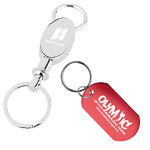 Choose from many different styles of keychains and print your company name or logo. These are great for building brand recognition, as your company’s logo will surely burn into the minds of those who use and see them as promotional keychains. Have your team represent you everywhere that they go. These are ideal for giveaways or to be sold to promote your business, school, team, event, company, and more. Our unique selection of key tags are catered to all types of personalities. We have hundreds of styles of chains available from from Rubik’s Cubes to whistles to bottle openers. These keychains are designed to make life more convenient. Show off what makes you an individual. Make something as simple as holding your keys more fun with your very own Garrett Specialties’ key tag. Our custom key holders are an excellent way to legitimize your company. 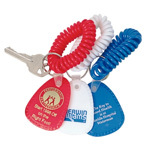 Select any type of gadget, ring, chain, or tag and add your company name or logo then decide on your color. Give your workers something to be proud of when they open any door. 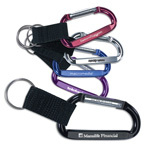 These corporate keychains make the perfect corporate gifts and giveaways. Tailor your own key holders to fit the essence of your company. Give your employees gifts that are not just charming and ornamental, but convenient ones that they can actually use everyday. Every time they go to open their doors, they will look down and remember why they love their job. Who says you can’t take work home with you? Have your employees represent your company with pride even at home with these custom office keychains. Never has the office place been so unified with these adorable company gifts. Design items to your liking and select any style that you desire.